Marc-André presents a fascinating juxtaposition of two composers who are not obviously musically related, but who are proved on this album to be a felicitous combination. Schumann’s well-loved Kinderszenen (‘Scenes from childhood’) cycle is a masterpiece: each piece is as deftly and exquisitely crafted as anything in his more outwardly sophisticated mode. From the haunting beauty of the opening ‘From foreign lands and people’ (‘Von fremden Ländern und Menschen’), via the spare eloquence of the central ‘Dreaming’ (‘Träumerei’), to the quiet rhetoric of ‘The poet speaks’ (‘Der Dichter spricht’), the listener is taken through nuances of emotion whose effects are heartrendingly poignant. Waldszenen (‘Forest scenes’) is another collection of miniatures, and Schumann’s last major cycle for solo piano. This deeply ‘Romantic’ work in the most psychological sense of the word is no objective foray into the woods, but a very personal reaction to an imagined landscape; and equally striking is the sense that each piece represents just a shard of a larger experience. On the whole it is the more bucolic aspect that Schumann explores, though these pieces are not without darker shadows. And while they may be technically fairly straightforward, their changeability calls for the quickest of reactions and a wealth of subtle nuance. Over half a century separates Schumann’s nature-inspired Waldszenen from the first book of Janáček’s On the overgrown path. The subject matter is darker and more oblique and the piano writing is deceptively treacherous, many of the difficulties far from overt. The title of the overall cycle refers to a Moravian wedding song, the bride lamenting that ‘The path to my mother’s has become overgrown with clover’. The sequence of ten pieces that comprises Book 1 constitutes, as the scholar John Tyrrell has written, some of the ‘profoundest, most disturbing music that Janáček had written, their impact quite out of proportion to their modest means and ambition’. Friedrich Wieck was, as Schumann discovered, the father-in-law from hell. He so opposed the burgeoning relationship between the composer and his precious daughter—eight years Robert’s junior yet, one imagines, quite feisty enough to know her own mind—that he did everything in his power to break things up between them, from taking Clara on a seven-month concert tour to fighting the engagement in the law courts. As history relates, his efforts came to nothing, and love triumphed. While apart during that long tour in 1838, Robert and Clara wrote constantly to one other, and from Schumann streamed a succession of piano works, not least Kinderszenen, the most touching recollection of childhood. As he wrote to Clara, ‘Perhaps it was an echo of what you once said to me, that “Sometimes I seemed like a child”; anyway, I was suddenly visited by inspiration, and then I knocked off about thirty quaint little things, from which I have selected about twelve … You will enjoy them—though you will have to forget you are a virtuoso.’ When Kinderszenen was published the final tally of pieces was thirteen. ‘Knocked off’ hardly does these pieces justice; despite being modest in dimensions, each piece is as deftly and exquisitely crafted as anything in his more outwardly sophisticated mode. And though certain numbers may be simple enough for a reasonably talented child to play (or at least to stumble through) most are not, as witness the wildly exuberant ‘Knight of the hobbyhorse’ (Ritter vom Steckenpferd) or the manically gleeful ‘Blind man’s buff’ (Hasche-Mann). Among the most touching portraits here are the ‘Pleading child’ (Bittendes Kind), quietly insistent but ending, like the ‘Child falling asleep’ (Kind im Einschlummern), without resolution, tenderly catching the emotional inconsistency of youth. And Schumann conceives it beautifully as a cycle, from the haunting beauty of the opening ‘From foreign lands and people’ (Von fremden Ländern und Menschen), via the spare eloquence of the central ‘Dreaming’ (Träumerei), to the quiet rhetoric of ‘The poet speaks’ (Der Dichter spricht), the subject holding his audience rapt, his soliloquy ending in a whisper at the lower end of the keyboard. Schumann’s Waldszenen (‘Forest scenes’) is another cycle of fragments, written in a matter of days over New Year, 1849; dating from eleven years after Kinderszenen, it was his last major cycle for solo piano. The forest that it explores was a subject close to the heart of any self-respecting Romantic, be they writer, poet, artist or musician. Its appeal lay in its contrast: nature at its most beautiful but also an unknowable place. But there’s more to it than that, for it is not simply about ‘nature’ per se but the notion of man’s position within that wilderness, and indeed how engagement with such a thing could in turn affect man’s own view of himself; the external as a means of examining the internal, in other words. 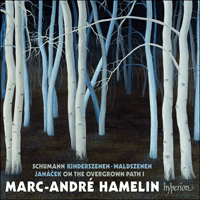 Certainly, in Waldszenen this is no objective foray into the woods but a very personal reaction to this imagined landscape; and equally striking is the sense that each piece represents just a shard of a larger experience, an aural snapshot, if you will. On the whole it is the more bucolic aspect that Schumann explores, though these pieces are not without darker shadows. And while they may be technically fairly straightforward, their changeability calls for the quickest of reactions and a wealth of subtle nuance. All seems well in the first number (Eintritt, ‘Entry’), its gently murmuring theme welcoming us into the forest in the most benign manner possible. The energetic Jäger auf der Lauer (‘Hunters on the lookout’), horn calls aplenty, gives the lie to the idea that Schumann—beset by personal demons by this point in his life—had lost his compositional way, and there’s a delightful mock-seriosity to the throwaway ending. The mood switches again in the next two pieces, Einsame Blumen (‘Lonely flowers’) and Verrufene Stelle (‘Place of evil fame’), tinged in turn by sadness and then a persistent unease that is only banished by the rollicking Freundliche Landschaft (‘Friendly landscape’), which is followed by a study in consolation and reassurance, Herberge (‘Shelter’). With No 7, the famous Vogel als Prophet (‘Bird as prophet’), Schumann seems to reach almost proto-Impressionistic realms, its central chorale-like section lending it an almost sacred gravitas. We return to compositionally safer, more pastoral territory with Jagdlied (‘Hunting song’), which presents an image of the play of horses’ hooves and the jolly red coats of the hunstmen, a notably child-friendly vision. With Abschied (‘Farewell’), the innocence of the opening seems to be regained as we bid the forest a poignant farewell. 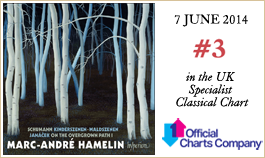 Over half a century separates Schumann’s nature-inspired Waldszenen from the first book of Janáček’s On the overgrown path. But the wind now blows several degrees chillier, the subject matter is darker and more oblique and the piano writing is deceptively treacherous, many of the difficulties far from overt. So it’s striking to think that the impetus behind these pieces was not as piano music at all but as arrangements of Moravian folksongs for harmonium. This, at least, was the starting-point, when in 1897 Janáček was asked to contribute to a series of works for harmonium under the title Slovanské melodie. And it was as part of the fifth volume of this publication (dating from 1901) that three of the pieces that became parts of On the overgrown path first saw the light of day. However, they had by this point become mood pieces rather than straightforward arrangements of folksongs. Janáček added two more numbers the following year but the remaining five (Nos 3, 5, 6, 8 and 9) weren’t completed until 1908 (Nos 3, 6 and 9) and 1911 (Nos 5 and 8). The title of the overall cycle refers to a Moravian wedding song, the bride lamenting that ‘The path to my mother’s has become overgrown with clover’. One of the striking aspects about this cycle is the titles themselves. The earliest five pieces to be composed originally appeared without titles, and it was only at the behest of the music critic Jan Branberger, who liked the pieces and requested some hint as to their inspiration, that Janáček jotted down a sequence of descriptive headings. Yet those proved to be no more than an interim thought: on reflection they shifted further, and sometimes to interesting effect. No 6, for example, went from ‘The bitterness of reproach’ via ‘The bitterness of disappointment’ to its final title, ‘Words fail!’. The sequence of ten pieces that comprise Book 1 constitutes, as the scholar John Tyrrell has written, some of the ‘profoundest, most disturbing music that Janáček had written, their impact quite out of proportion to their modest means and ambition’. Janáček is one of those figures whose music is seldom what it seems: even an outwardly or apparently carefree idea is rarely allowed to remain that way, with the composer twisting the knife via darkened harmonies, obsessive rhythms or the juxtaposition (in the operas particularly) with a dramatic context that makes it clear that all is far from well. Frequently pieces within On the overgrown path begin disarmingly but are emotionally derailed, within the briefest of spans. The first number, ‘Our evenings’, is one such instance, setting off gently but the sense of calm viciously interrupted by a violent inner section. Though it returns to its initial mood, it is now uneasy, its equilibrium shattered by the outburst. The piece was initially called ‘Glance to’: what are we to make of this enigma? Certainly, there’s nothing cosy or homely about the scene conjured up by Janáček here. Similarly, ‘A blown-away leaf’ also begins simply, this time with the unmistakable hint of a wide-eyed folksong. But Janáček soon begins torturing it, inserting pauses that stretch its phrases into irregular lengths, and, as the emotional temperature rises, breaking up the lines into impassioned gasps, complete with trills, that seem to have less to do with the piece’s final title and more to do with the initial one, ‘Declaration’, which the composer explained was a declaration of love—and not a straightforward one, to judge from the overwhelming sense of edginess. ‘Come with us!’, an extrovert polka, offers a more cheerful interlude, though even here Janáček can’t resist adding darker colourings that offer moments of introspection. But bucolic good cheer is entirely absent from the next piece, as the composer draws inspiration from the Madonna at Fry´dek (now Fry´dek-Místek), which wasn’t far from Hukvaldy, the village where he had been born. This may be a reminiscence of childhood visits to the famed Madonna, who had been the subject of pilgrimages for centuries. But it is equally possible that Janáček was in fact recalling a rather more recent visit to the town that he’d made with his wife Zdenka. In this musical evocation, the hymn tune traditionally sung by pilgrims is heard approaching and then receding, as the faithful disappear into the distance. This is followed by a return to extroversion, ‘They chattered like swallows’, which is dominated by an angular, folk-imbued motif characterized by a wide span and chromatic twists (the left hand sometimes in sync with the right, at other times imitating it), until a Meno mosso section features more sustained writing in the left hand, while the right simply repeats the outline of the first bar, as if incapable of finishing the phrase. In ‘Words fail!’ it seems that the depth of emotion overwhelms the protagonist, try as he might to get the words out. A greater sense of calm is achieved only at the end—though it may be emotional exhaustion rather than repose. ‘Good night!’ was, like ‘The Fry´dek Madonna’, published in 1902 and in it Janáček sets the scene with a plaintive accompaniment, the left hand tracing a descending line while the flickering right hand focuses on the interval of an octave. The melody that then appears, triple piano in the right hand and marked espressivo, is built from that left-hand line, the flickering motif now also, in the alto register, tracing the interval of a third. But this idea gradually grows more insistent and comes to overpower the melody, demonstrating early use of a technique that became a hallmark of Janáček’s inherently edgy style, and something possibly derived from Moravian folk music. To close, a work whose title is highly evocative. The barn owl had long been associated with bad omens, from the Ancient Greeks onwards. The word in Czech (‘sýček’) also refers to a person who is pessimistic. It makes a suitably dramatic entrance, the loud flourish imitative of the bird’s wings, which is followed by the cry of the owl (a two-note descending phrase), set against a tremolo that adds to the oppressive atmosphere. What comes next is quite unexpected—a chordal theme, faintly religious in its overtones, that moves the music from minor-key instability to a major-key reassurance. Janáček plays on the tension of juxtaposing these two ideas until eventually the confident demeanour of the major-key section is displaced by a darker mood. It ends with a final reference to the call of the barn owl, its lack of resolution entirely in keeping with the cycle as a whole and leaving the listener with a profound sense of disquiet. Friedrich Wieck fut, comme Schumann le découvrit, un diable de beau-père, qui s’opposa à la relation naissante entre le compositeur et sa précieuse fille—de huit ans la cadette de Robert mais, peut-on imaginer, avec bien assez de cran pour savoir ce qu’elle voulait—au point de faire tout son possible pour détruire ce qu’il y avait entre eux: il entraîna Clara dans une tournée de sept mois, en 1838, et alla jusqu’à contester leurs fiançailles devant les tribunaux. Mais, comme l’histoire nous l’apprend, ses tentatives échouèrent et l’amour triompha. Bien que séparés pendant cette longue tournée, Robert et Clara s’écrivirent constamment et Schumann produisit toute une série d’œuvres pour piano, à commencer par les Kinderszenen, souvenirs d’enfance touchants entre tous. Comme il l’écrivit à Clara: «C’est peut-être là un écho à ce que tu m’as dit une fois, que “parfois je ressemblais à un enfant”; en tout cas, j’ai été soudain visité par l’inspiration, puis j’ai troussé une trentaine de curieuses petites choses et j’en ai retenu une douzaine … Elles te plairont—même s’il te faudra oublier que tu es une virtuose.» À leur parution, les Kinderszenen comptèrent finalement treize pièces. «Troussé» ne rend guère justice à ces morceaux que leurs dimensions modestes n’empêchent pas d’être aussi habilement et exquisément ciselés que tout ce que Schumann produisit dans sa veine plus ouvertement sophistiquée. Et si certaines pièces sont assez simples à jouer (fût-ce d’une manière mal assurée) pour un enfant raisonnablement talentueux, la plupart ne le sont pas, comme l’attestent «Cavalier sur le cheval de bois» (Ritter vom Steckenpferd), d’une exubérance fantasque, et «Colin-Maillard» (Hasche-Mann), follement joyeux. L’un des plus touchants portraits, «L’enfant suppliant» (Bittendes Kind), est doucement obstiné mais, comme «L’enfant s’endort» (Kind im Einschlummern), il s’achève sans résolution, saisissant avec tendresse l’incohérence émotionnelle de la jeunesse. Et Schumann conçoit magnifiquement le tout en un cycle allant de la lancinante beauté du liminaire «Gens et Pays étrangers» (Von fremden Ländern und Menschen) à l’éloquence dépouillée de «La Rêverie» (Träumerei) centrale pour atteindre la paisible rhétorique de «Le poète parle» (Der Dichter spricht) qui, par son sujet, fascine son auditoire et dont le soliloque s’achève dans un murmure, dans le bas du clavier. Autre cycle de fragments, Waldszenen («Scènes de la forêt») fut composé dans les premiers jours de 1849, soit onze ans après Kinderszenen, et constitue le dernier grand cycle schumannien pour piano solo. La forêt qui y est explorée était un thème cher au cœur de tout bon romantique, qu’il fût écrivain, poète, artiste ou musicien. Un attrait qui tient à son contraste même: elle est ensemble la nature dans ce qu’elle a de plus magnifique et un lieu inconnaissable. Mais il y a plus: il ne s’agit pas de la seule «nature» en tant que telle mais de la position de l’homme au cœur de ce désert et, partant, de la manière dont l’éveil à ce genre de notion pourrait à son tour affecter la vision qu’il a de lui-même—autrement dit, l’extérieur comme moyen d’examiner l’intérieur. Dans Waldszenen, nulle incursion tangible dans les bois, assurément, mais une réaction toute personnelle à ce paysage fantasmé; et l’on est tout autant frappé de ce que chaque pièce semble n’être qu’un tesson d’une expérience plus vaste, un instantané sonore, en quelque sorte. Globalement, c’est le côté davantage bucolique que Schumann explore, encore que ces pièces ne soient pas sans ombres plus marquées. Et si elles peuvent se montrer techniquement assez simples, leur variabilité exige les réactions les plus vives et une profusion de nuances subtiles. Dans le premier numéro (Eintritt, «Entrée»), tout paraît beau et le thème, doux murmure, nous accueille dans la forêt avec la plus grande bienveillance. L’énergique Jäger auf der Lauer («Chasseurs à l’affût»), où abondent les appels de cor, dément l’idée selon laquelle Schumann, assailli par ses démons, ne savait plus composer; la conclusion désinvolte affiche une charmante pseudo-gravité. Un nouveau changement de climat s’opère dans les deux pièces suivantes, Einsame Blumen («Fleurs solitaires») et Verrufene Stelle («Lieu maudit»), nuées par la tristesse puis par un malaise persistant seulement balayé par le berceur Freundliche Landschaft («Paysage amical»), avant Herberge («Auberge»), étude de la consolation et du réconfort. Le nº 7, le célèbre Vogel als Prophet («L’Oiseau-Prophète»), semble toucher à des sphères quasi proto-impressionnistes, sa section centrale façon choral lui conférant une gravité presque sacrée. Nous regagnons un territoire compositionnellement plus sûr, plus bucolique avec Jagdlied («Chant de chasse») et ses sabots de chevaux, ses gaies vestes rouges de chasseurs—une image remarquablement adaptée à l’enfance. Avec Abschied («Adieu»), l’innocence du début semble restaurée alors que nous adressons un poignant adieu à la forêt. Un bon demi-siècle sépare ces Waldszenen, inspirées par la nature, de la première série de Sur un sentier recouvert de Janáček. Là, le vent est plus glacial: c’est que le thème est davantage sombre, indirect, et que l’écriture pianistique est d’une traîtresse perfidie, nombre des difficultés étant tout sauf flagrantes. Il n’en est que plus frappant de songer que ces pièces ne furent en rien pensées comme des œuvres pour piano mais comme des arrangements pour harmonium de chants populaires moraves. Tel fut du moins le point de départ pour Janáček à qui l’on demanda, en 1897, de contribuer à une série d’œuvres pour harmonium intitulée Slovanské melodie. Ce fut dans le cadre du cinquième volume de cette collection (daté de 1901) que trois œuvres de Sur un sentier recouvert virent le jour—mais, de simples arrangements de chants populaires, elles étaient devenues des pièces d’ambiance. Deux numéros furent ajoutés en 1902 mais les cinq derniers ne furent pas achevés avant 1908 (nos 3, 6 et 9) et 1911 (nos 5 et 8). Par son titre, ce cycle renvoie à un chant nuptial morave dans lequel la mariée déplore: «Le chemin qui mène chez ma mère s’est recouvert de trèfle.» Il frappe surtout par les intitulés de ses morceaux. À l’origine, les cinq pièces les plus anciennes parurent sans titre et ce fut seulement à la requête du critique musical Jan Branberger, qui les aimait et voulait donner une idée de ce qui les avait inspirées, que Janáček troussa une série de titres descriptifs qui s’avérèrent n’être guère plus qu’une pensée provisoire: après réflexion, il les changea, parfois avec un résultat intéressant. Le nº 6, par exemple, passa par «L’amertume du reproche» et «L’amertume de la déception» avant le définitif «Les mots manquent!». Comme l’a écrit John Tyrrell, spécialiste de Janáček, les dix pièces de la première série sont parmi «les musiques les plus profondes et les plus troublantes de Janáček, leur impact étant totalement disproportionné par rapport à la modestie de leurs moyens et de leur ambition». Janáček est de ceux dont la musique est rarement ce qu’elle paraît être: même une idée en apparence insouciante, il la laisse peu souvent tranquille et la triture via des harmonies plus sombres, des rythmes obsessionnels ou (surtout dans les opéras) la juxtaposition avec un contexte dramatique montrant que tout est loin de bien aller. Souvent, les pièces de Sur un sentier recouvert commencent de façon désarmante mais déraillent émotionnellement en un rien de temps. Ce que le premier numéro, «Nos soirées», illustre bien: il part en douceur, un calme que vient brutalement interrompre une violente section intérieure. Le climat initial a beau faire son retour, l’inquiétude demeure: le déchaînement a ruiné l’équilibre de cette pièce, d’abord intitulée «Coup d’œil»—mais que faire d’une telle énigme? La scène que Janáček fait naître ici n’a assurément rien de douillet, d’accueillant. De même, «Une feuille emportée» commence simplement avec, cette fois, une flagrante allusion à un chant populaire ingénu que Janáček torture bientôt: il insère des pauses qui étirent les phrases sur d’irrégulières longueurs et, à mesure que l’émotion s’enfièvre, il disloque les lignes en halètements fervents, avec trilles, davantage en rapport, semble-t-il, avec le titre initial de l’œuvre, «Déclaration», sous-entendu d’amour, expliqua le compositeur—et pas directe, à en juger d’après le sentiment d’extrême nervosité. «Venez avec nous!», une polka extravertie, offre un interlude plus franchement enjoué même si, là encore, Janáček ne peut s’empêcher d’assombrir le tableau pour quelques moments d’introspection. Nulle gaieté bucolique, en revanche, dans la pièce suivante, inspirée à Janáček par la Vierge de Frýdek (aujourd’hui Frýdek-Místek), non loin de Hukvaldy, son village natal. Peut-être se rappela-t-il ses visites enfantines à la célèbre Vierge, objet de pèlerinages des siècles durant. À moins qu’il ne se soit souvenu d’une visite plus tardive, en compagnie de sa femme Zdenka. Dans cette évocation musicale, on entend la mélodie de l’hymne traditionnellement chantée par les pèlerins s’approcher puis s’éloigner, tels les fidèles s’évanouissant au loin. L’extraversion est de retour avec «Elles bavardaient en hirondelles», une pièce que domine un motif saccadé, d’imprégnation folklorique, caractérisé par une large étendue et des inflexions chromatiques (la main gauche tantôt synchronisée avec la droite, tantôt l’imitant), jusqu’à ce qu’une section Meno mosso présente une écriture davantage soutenue à la main gauche, la droite se contentant alors de répéter le contour de la première mesure, comme incapable de finir la phrase. Dans «Les mots manquent!» la profondeur de l’émotion semble accabler le protagoniste, qui essaie de prononcer des mots. C’est seulement à la fin qu’on atteint à un plus grand sentiment de calme—même s’il s’agit plus, peut-être, d’épuisement émotionnel que de repos. «Bonne nuit!» parut en 1902 (comme «La Vierge de Frýdek») et Janáček plante le décor avec un accompagnement plaintif, la main gauche traçant une ligne descendante tandis que la main droite vacillante se concentre sur l’intervalle d’octave. La mélodie qui suit, triple piano à la main droite et marquée espressivo, est bâtie de cette ligne à la main gauche, le motif vacillant traçant désormais une tierce, à l’alto. Mais cette idée, de plus en plus insistante, en vient à dominer la mélodie, démontrant là un usage précoce d’une technique appelée à devenir l’une des griffes du style intrinsèquement nerveux de Janáček—un héritage du folklore morave? Pour terminer, une œuvre au titre des plus évocateurs. Depuis l’Antiquité grecque, la chevêche est un oiseau de mauvais augure. Le mot tchèque «sýček» renvoie d’ailleurs, aussi, à une personne pessimiste. La pièce commence dramatiquement, comme il se doit, la puissante fanfare imitant les ailes de la chouette, dont le cri (une phrase descendante de deux notes) retentit bientôt sur fond de trémolo, ajoutant à l’atmosphère oppressante. La suite est tout ce qu’il y a de plus inattendu: un thème en accords, aux accents vaguement religieux, fait passer la musique de l’instabilité du mineur au réconfort du majeur. Janáček joue sur la tension née de la juxtaposition de ces deux idées jusqu’à ce que la confiance de la section en majeur soit supplantée par un climat plus sombre. L’œuvre s’achève sur une ultime référence au cri de la chevêche, son absence de résolution—dans le droit fil de tout le cycle—laissant l’auditeur sur un profond sentiment d’inquiétude. Friedrich Wieck war, wie Schumann erfahren sollte, ein schrecklicher Schwiegervater. Er stellte sich so vehement gegen die sich anbahnende Beziehung zwischen dem Komponisten und seiner teuren Tochter—die zwar acht Jahre jünger war als Schumann, aber offensichtlich genügend selbstbewusst, um zu wissen, was sie wollte—, dass er alles in seiner Macht Stehende tat, von einer siebenmonatigen Konzerttournee, die Clara absolvieren musste, bis zu juristischen Verfahren gegen die Verlobung, um die Beziehung zu beenden. Wie wir heute jedoch wissen, sollten sich seine Bemühungen als zwecklos erweisen; die Liebe triumphierte. Während ihrer langen Trennung im Jahre 1838, als Clara sich auf eben jener Konzertreise befand, schrieben die beiden sich regelmäßig und Schumann komponierte ein Klavierstück nach dem anderen, darunter nicht zuletzt die Kinderszenen, eine besonders anrührende Erinnerung an die Kindheit. Er schrieb an Clara: „Was ich noch componirt, war wie ein Nachklang von Deinen Worten, einmal wo Du mir schriebst, ich käme Dir auch manchmal wie ein Kind vor.—Kurz, es war mir ordentlich wie im Flügelkleid und hab da an die 30 kleine putzige Dinger geschrieben, von denen ich ihrer zwölf auserlesen und ‘Kinderscenen’ genannt habe. Du wirst Dich daran erfreuen, mußt Dich aber freilich als Virtuosin vergeßen …“ Als die Kinderszenen veröffentlicht wurden, waren es insgesamt dreizehn Stücke. Dass Schumann diese Stücke „wie im Flügelkleid“ geschrieben habe, wird ihnen kaum gerecht—obwohl sie kleinformatig sind, ist doch jedes Stück ebenso gewandt und differenziert gestaltet wie seine anderen, äußerlich anspruchsvoller wirkenden Werke. Und obwohl gewisse Nummern für ein relativ begabtes Kind (mehr oder minder) spielbar sein mögen, so richtet sich der Großteil doch an reifere Interpreten, wie etwa in dem wild-überschwänglichen Ritter vom Steckenpferd oder dem manisch schadenfrohen Hasche-Mann deutlich wird. Zu den anrührendsten Porträts zählen hier Bittendes Kind, das zwar ruhige Beharrlichkeit vermittelt, jedoch, ebenso wie Kind im Einschlummern, ohne Auflösung endet und so in einfühlsamer Weise die kindliche emotionale Widersprüchlichkeit einfängt. Ebenso gelungen ist Schumanns zyklische Anlage, von der eindrucksvollen Schönheit des am Anfang stehenden Von fremden Ländern und Menschen über die sparsame Eloquenz der zentralen Träumerei bis hin zur ruhigen Rhetorik von Der Dichter spricht, wobei der Protagonist eine gespannte Aufmerksamkeit bei seinem Publikum aufrechtzuerhalten weiß und sein Monolog dann mit einem Flüstern in der Tiefe endet. Die Waldszenen Schumanns sind ein weiterer Zyklus fragmentarischer Werke, die innerhalb weniger Tage über Neujahr 1849 entstanden; er schrieb sie elf Jahre nach den Kinderszenen und es sollte dies sein letzter großer Zyklus für Klavier solo bleiben. Der Wald, der hier erkundet wird, war ein urromantisches Thema, sei es für Schriftsteller, Dichter, Künstler oder Musiker. Die Anziehungskraft des Waldes lag in seinen Gegensätzen—die Natur als wunderschöner, aber auch unergründlicher Ort. Doch geht es hier um mehr, da diese Stücke nicht allein von der „Natur“ handeln, sondern eher von der Einordnung des Menschen in diese Wildnis und die Selbstbetrachtung des Menschen nach der Auseinandersetzung mit der Natur; in anderen Worten: Das Äußere als Mittel der Innenbetrachtung. Die Waldszenen sind sicherlich kein objektiver Ausflug in die Natur, sondern eine äußerst persönliche Reaktion auf diese imaginierte Landschaft; und ebenso bemerkenswert ist der Eindruck, dass die Stücke jeweils nur ein Bruchstück einer größeren Erfahrung repräsentieren, sozusagen einen klanglichen Schnappschuss darstellen. Im Großen und Ganzen befasst Schumann sich hier mit dem Bukolischen, obwohl die Stücke nicht ohne dunklere Schattenseiten sind. Technisch gesehen mögen sie relativ unkompliziert sein, doch verlangt ihre Wechselhaftigkeit gute Reaktionsfähigkeit und einen äußerst nuancierten Ausdruck. In der ersten Nummer, Eintritt, scheint alles in Ordnung zu sein und das sanft säuselnde Thema heißt den Hörer in harmlosester Art und Weise im Wald willkommen. Die energischen Jäger auf der Lauer, wo zahlreiche Hornsignale erklingen, widerlegen die These, dass Schumann—zu diesem Zeitpunkt in seinem Leben heimgesucht von persönlichen Dämonen—sein Kompositionstalent verloren habe; das unvermittelte Ende ist von einer köstlichen Schein-Ernsthaftigkeit geprägt. In den nächsten beiden Stücken, Einsame Blumen und Verrufene Stelle, ändert sich die Stimmung wiederum; zunächst stellt sich eine Traurigkeit ein, die dann von einem hartnäckigen Unbehagen abgelöst wird, welches sich erst durch die Freundliche Landschaft vertreiben lässt, auf das eine Studie des Trosts und der Beschwichtigung—Herberge—folgt. Mit Nr. 7, dem berühmten Vogel als Prophet, scheint Schumann eine geradezu impressionistische Sphäre zu erreichen; der choralartige Mittelteil verleiht dem Stück eine fast geistliche Gravität. Danach kehren wir mit dem Jagdlied zu kompositorisch sichereren, eher bukolischen Gefilden zurück, wo sich ein Bild von galoppierenden Pferden und roten Jäger-Röcken präsentiert—eine bemerkenswert kinderfreundliche Vision. Mit Abschied scheint sich die Unschuld des Anfangs wieder einzustellen und es wird dem Wald ein ergreifendes Lebewohl gesagt. Zwischen Schumanns naturinspirierten Waldszenen und dem ersten Band von Janáčeks Verwachsenem Pfade liegen über fünfzig Jahre. Der Wind bläst inzwischen um mehrere Grade kälter, das Thema ist düsterer und verdeckter und der Klaviersatz ist von einer trügerischen Komplexität—viele Schwierigkeiten sind alles andere als offenkundig. Es ist also durchaus bemerkenswert, wenn man sich klarmacht, dass diese Werke ursprünglich nicht als Klaviermusik gedacht waren, sondern als Arrangements mährischer Volkslieder für Harmonium. Es war dies jedenfalls der Ausgangspunkt, als Janáček 1897 darum gebeten wurde, Werke für Harmonium für eine Reihe mit dem Titel Slovanské melodie zu komponieren. Drei Stücke, die dem Zyklus Auf verwachsenem Pfade angehören sollten, wurden erstmals im fünften Band dieser Publikation (von 1901) veröffentlicht. Doch waren sie inzwischen eher Stimmungsstücke als einfache Volkslieder-Bearbeitungen. Janáček fügte im folgenden Jahr noch zwei Nummern hinzu, doch die übrigen fünf (Nr. 3, 5, 6, 8 und 9) wurden erst 1908 (Nr. 3, 6 und 9), beziehungsweise 1911 (Nr. 5 und 8) fertiggestellt. Der Titel des Zyklus bezieht sich auf ein mährisches Hochzeitslied, in dem sich die Braut beklagt: „Der Pfad zu meiner Mutter ist vom Klee verwachsen.“ Überraschend in diesem Zyklus sind die Titel selbst. Die ersten fünf Stücke erschienen ursprünglich ohne Titel; erst als der Musikkritiker Jan Branberger, dem die Stücke gefielen, um einen Hinweis auf ihren Ursprung bat, notierte Janáček eine Reihe von beschreibenden Titeln. Doch waren diese nicht mehr als vorläufige Gedanken—mit der Zeit veränderten sie sich, und wurden zum Teil noch interessanter. So hieß Nr. 6 zunächst „Die Bitternis über einen Vorwurf“, woraus dann „Die Bitternis der Enttäuschung“ und schließlich „Es stockt das Wort!“ wurde. Die 10 Stücke, aus denen Band 1 besteht, gehören dem Janáček-Forscher John Tyrrell zufolge zu der „tiefgründigsten und verstörendsten Musik Janáčeks überhaupt, deren Wirkung in keinem Verhältnis zu ihrer bescheidenen Anlage und Ambition steht“. Janáček ist einer jener Komponisten, dessen Musik oft nicht das ist, was sie zunächst zu sein vorgibt—selbst eine offensichtliche, beziehungsweise nach außen hin sorglose Idee darf nur selten eben das bleiben, da der Komponist mit dunklen Harmonien, obsessiven Rhythmen oder auch der Konfrontation (insbesondere in den Opern) mit einem dramatischen Kontext, durch den deutlich wird, dass durchaus nicht alles in Ordnung ist, für Aufruhr sorgt. Häufig beginnen die Stücke von Auf verwachsenem Pfade entwaffnend unschuldig, erfahren dann aber innerhalb kürzester Zeit eine emotionale Entgleisung. Die erste Nummer, „Unsere Abende“, ist ein solches Beispiel; es beginnt sanft, doch wird diese innere Ruhe von einem brutalen Mittelteil grausam unterbrochen. Obwohl die Musik dann zu der Anfangsstimmung zurückkehrt, ist die Atmosphäre doch beklommen und durch den Ausbruch aus dem Gleichgewicht gebracht. Dieses Stück hieß zunächst „Blick auf“: Was sollen wir aus diesem Rätsel machen? Jedenfalls schafft Janáček hier keine gemütliche oder heimelige Kulisse. In ähnlicher Weise beginnt auch „Ein verwehtes Blatt“ mit einem schlichten Ausdruck, und diesmal mit unverwechselbarer Anspielung an ein naives Volkslied. Doch beginnt Janáček schon bald mit der Folter, fügt Pausen ein, wodurch die Phrasen derart gedehnt werden, dass sie jeweils von unregelmäßiger Dauer sind; zudem unterteilt er die Linien in leidenschaftliche Seufzer, verziert mit Trillern, die weniger zu dem letztendlichen Titel des Stücks zu passen scheinen, sondern eher zum ersten, „Erklärung“, die dem Komponisten zufolge eine Liebeserklärung war—und der offensichtlichen Unruhe nach zu urteilen war diese Liebeserklärung wohl nicht unkompliziert. „Kommt mit!“ ist eine extravertierte Polka und fungiert als fröhliches Zwischenspiel, obwohl Janáček selbst hier nicht davon ablassen kann, dunklere Farben hinzuzufügen, die für Momente der Innenschau sorgen. Im nächsten Stück findet sich von bukolischer Fröhlichkeit allerdings keine Spur; Janáček lässt sich von der Muttergottes in Frýdeck (dem heutigen Frýdek-Místek) inspirieren, die sich in der Nähe von seinem Geburtsort Hukvaldy befand. Möglicherweise handelt es sich hierbei um eine Kindheitserinnerung an Besichtigungen der berühmten Muttergottes, die bereits seit Jahrhunderten ein beliebter Wallfahrtsort war. Vielleicht erinnerte sich Janáček aber auch an einen deutlich weniger lang zurückliegenden Besuch der Stadt, den er zusammen mit seiner Frau Zdenka unternommen hatte. In dieser musikalischen Darstellung scheint die traditionsgemäß von den Pilgern gesungene Hymnusmelodie sich zunächst zu nähern und dann, wenn die Gläubigen weiterziehen, sich wieder zu entfernen. Darauf folgt wiederum ein extravertiertes Werk, „Sie schwatzten wie die Schwalben“, das sich durch ein eckiges, volkstümliches Motiv mit großem Umfang und chromatischen Wendungen auszeichnet (wobei die linke Hand zuweilen synchron mit der rechten verläuft und sie sonst imitiert), bis in einem Meno mosso-Abschnitt ein anhaltenderer Satz für die linke Hand erklingt, während die rechte einfach die Konturen des ersten Takts wiederholt, als ob sie nicht imstande sei, die Phrase zu Ende zu führen. In „Es stockt das Wort!“ scheint die Tiefgründigkeit der Emotionen den Protagonisten zu überwältigen, so sehr er sich auch bemüht, die Worte herauszubringen. Erst am Ende stellt sich eine größere Ruhe ein, obwohl es sich hier möglicherweise eher um emotionale Erschöpfung als tatsächliche Ruhe handelt. „Gute Nacht!“ wurde, ebenso wie die „Frýdecker Muttergottes“, 1902 herausgegeben und Janáček bereitet die Kulisse mit einer klagenden Begleitung vor, wobei die linke Hand sich abwärts bewegt, während sich eine flimmernde rechte Hand auf ein Oktavintervall konzentriert. Die dann erklingende Melodie hat ein dreifaches Piano in der rechten Hand und eine als espressivo markierte Linie in der linken, und das flimmernde Motiv erscheint nun in Altlage und zeichnet zudem ein Terzintervall nach. Diese Idee wird jedoch immer insistierender, überwältigt schließlich die Melodie und demonstriert damit den frühen Einsatz einer Technik, die ein Markenzeichen für Janáčeks inhärent unruhigen Stil werden sollte und in vielleicht gewisser Weise aus der mährischen Volksmusik stammte. Das abschließende Werk trägt einen besonders sinnträchtigen Titel—„Das Käuzchen ist nicht fortgeflogen“. Die Schleiereule ist schon von den alten Griechen als schlechtes Omen verstanden worden. Im Tschechischen bezeichnet das Wort („sýček“) zudem eine pessimistische Person. Es beginnt entsprechend dramatisch, die laute, schwungvolle Geste imitiert das Flügelschlagen, worauf der Ruf der Eule folgt (eine absteigende zweitönige Figur), was gegen ein Tremolo gesetzt ist, welches zu der beklemmenden Atmosphäre beiträgt. Darauf folgt etwas Unerwartetes—ein akkordisches Thema mit entfernt religiösen Untertönen, das die Musik von einer Moll-Instabilität in ein beschwichtigendes Dur führt. Janáček spielt mit der Spannung der Gegenüberstellung dieser beiden Ideen, bis schließlich das zuversichtliche Auftreten des Dur-Teils von einer dunkleren Stimmung verdrängt wird. Das Stück endet mit einer letzten Anspielung auf den Ruf der Schleiereule, wobei die ausbleibende Auflösung ganz im Stil des Zyklus insgesamt gehalten ist und den Hörer mit einem tiefgehenden Unbehagen zurücklässt.